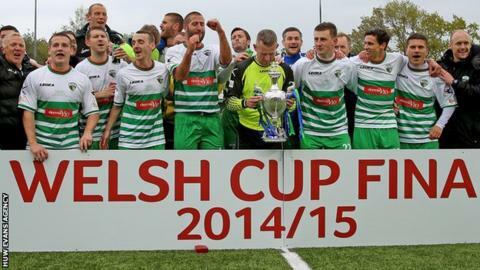 New Saints remain on course for a second successive domestic treble after a comfortable 5-0 Welsh Cup semi-final win over Gap Connah's Quay. Scott Quigley scored a hat-trick for the Welsh Premier leaders and Word Cup winners at Latham Park. Matty Williams and Jamie Mullan also scored for Saints, who had been beaten twice by Connah's Quay in the league this season. Craig Harrison's side will face Airbus UK Broughton in the final in May. Tony Gray scored a hat-trick as Airbus UK Broughton thrashed Port Talbot Town 7-0 to reach their first Welsh Cup final. Andy Preece's side led 3-0 at the interval through goals from Gray, Ryan Wignall and Kevin Monteiro. James Murphy scored two with Gray completing his hat-trick in between Airbus' Ryan Fraughan being sent-off.